Mix all dry ingredients thoroughly in a large bowl. Add eggs, milk and oil mix with the dry ingredients. Spoon batter into the waffle maker and cook until nice and golden. Let the waffles cool. Bring heavy whipping cream to a gentle simmer on a low heat. Add chocolate chips and stir in until melted. Take off the heat and let it cool. Once cooled, beat using hand held or stand mixer for 5 – 7 minutes on medium speed. Layer frosting between the waffles. 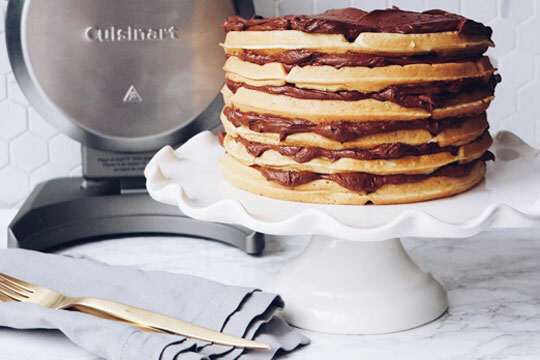 Make sure that both your waffles and frosting are cooled down to avoid melted frosting! Decorate with berried or cocoa powder or serve as is. This tastes best at room temperature!